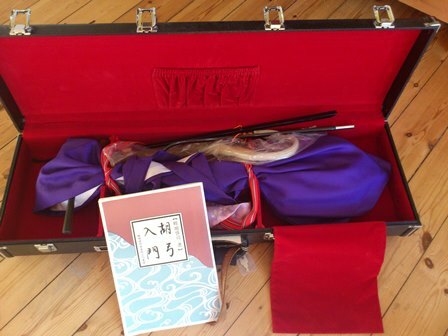 In Not by Love Alone I wrote about “the violin’s forgotten cousin” and Japan’s very own bowed instrument; the kokyû 胡弓 (or 日本胡弓). Its origins are disputed. 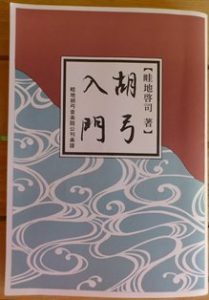 According to the most plausible theory, it was developed in Japan in the late sixteenth century from the shamisen 三味線, a three-stringed plucked lute and the Okinawan kokyû, whose ancestors may well have included the rebec. This would explain why early sources say the Okinawans used it to chase away snakes by imitating the cry of a mysterious beast called raheika – the Japanese word for rebec is rabeikaラベイカ　(羅面弦). Possibly, hearing the sixteenth-century Western merchants or missionaries play the rebec and other bowed instruments inspired the Japanese to make their own. Today it is rarely heard and many Japanese do not know it exists. At a recent visit to the Danish Music Museum I saw that they had a kokyû in their collection of East Asian musical instruments. “Forgotten” it was here as well, labelled as a shamisen (three-stringed, plucked lute). 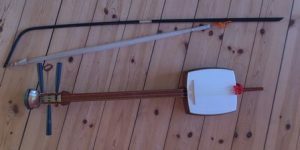 This is understandable, for with the bow and the high bridge missing there was nothing (at least to my untutored eye) to distinguish it from a shamisen except for the smaller size and the longish endpin. To play the kokyû the musician kneels with the body of the instrument on his lap and hold the bow at the same right angle to the strings (3 or 4 of them), turning the instrument to change strings. 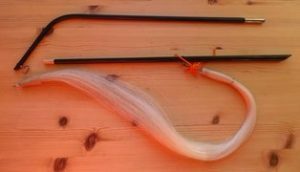 The bow is held a bit like a chopstick, the strings are tightened with the ring finger and the little finger of the right hand. The sound is quite small, even compared to other traditional instruments of Japan. You can here a short performance at Tokyo University of the Arts here. I have added a few pictures of the kokyû and tutor I bought in Japan a few years ago. You can read more about my experience and about the kokyû and its place in Japan’s traditional musics in the introductory chapter in Not by Love Alone. The bow can be taken apart for easy storage and transport. Accessories: the bridge is detached when the kokyû is not being played. The strings are made of silk. 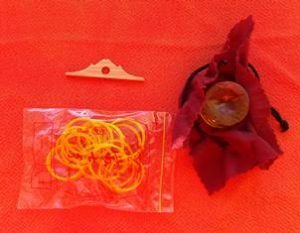 The rosin is the same as for violin bows. 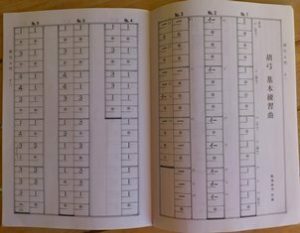 Kokyû notation (from AZECHI Keiji, “Kokyû nyûmon”) – these days most Japanese probably find Western staff notation easier though.